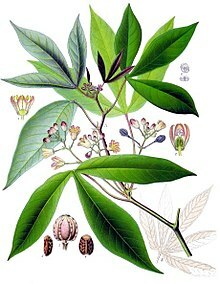 Manihot esculenta, commonly called cassava (/kəˈsɑːvə/), manioc, yuca, macaxeira, mandioca, aipim and Brazilian arrowroot, is a woody shrub native to South America of the spurge family, Euphorbiaceae. It is extensively cultivated as an annual crop in tropical and subtropical regions for its edible starchy tuberous root, a major source of carbohydrates. Though it is often called yuca in Spanish and in the United States, it is not related to yucca, a shrub in the family Asparagaceae. 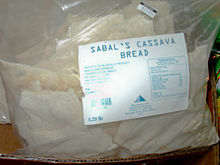 Cassava, when dried to a powdery (or pearly) extract, is called tapioca; its fried, granular form is named garri. 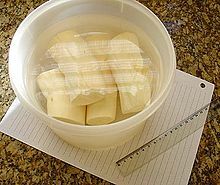 Cassava is the third-largest source of food carbohydrates in the tropics, after rice and maize. Cassava is a major staple food in the developing world, providing a basic diet for over half a billion people. It is one of the most drought-tolerant crops, capable of growing on marginal soils. Nigeria is the world's largest producer of cassava, while Thailand is the largest exporter of dried cassava. ^ Siritunga D; Sayre RT (September–October 2007). "Transgenic approaches for cyanogen reduction in cassava". J AOAC Int. 90 (5): 1450–5. PMID 17955993.